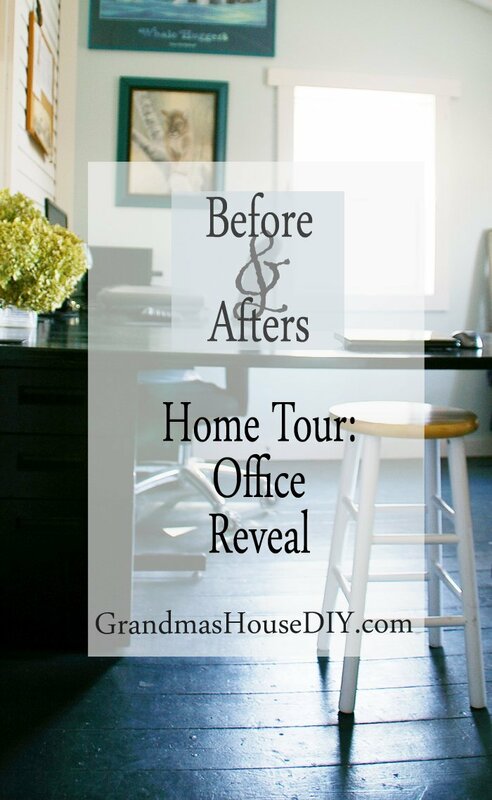 Home Tour: My final Office reveal after months I finally started over! Before we can truly start in on my office reveal we have to start by going way way back to literally the day we started remodeling the house. This room used to be what was left of this old house’s screened in porch. Back in the ’50s the other part of the screened in porch had been enclosed to create an entryway and my grandparents’ bedroom (so they could sleep on the first floor and their two girls could get the two bedrooms upstairs that is now our master suite). This part though remained a screened in porch and one of my very favorites places in my child hood. When my aunt and mom were little girls they would sleep out here throughout the Minnesota summers and both of them still recall it as being one of their very favorite things. 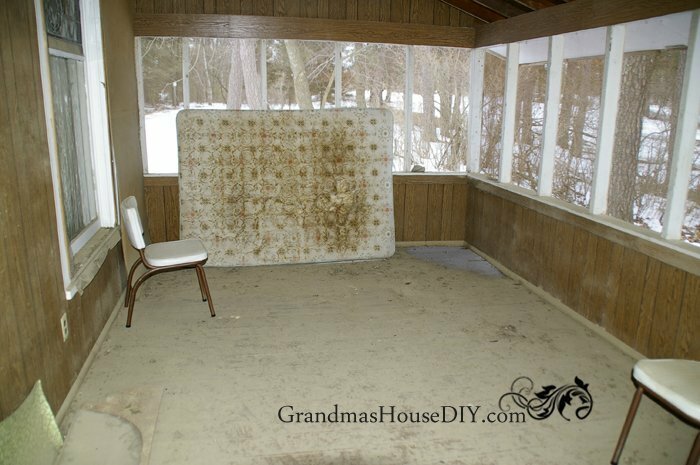 I still pine a bit for the old screened in porch and now, from time to time, wish I had not had to enclose it. However, this porch was only yards from the dirt road outside our house and I knew we would never be sitting out here to enjoy the dust and watching people drive by – not really what you would call a “scenic” view. And I needed an office! I made the hard decision in the renovation to enclose the entire rest of the screened in porch and chose this corner for my future office. Fifteen months later and we moved in! You can see there on the left the ancient stained glass window that was once the front window on the house (until the screened in porch was added in 1925) it has seen better days but we were able to save it and managed to not break it during the renovation! I had high hopes and dreams for this room and was absolutely stoked when I put my furniture in it and then, this happened. It just wasn’t working. The book case was too small and I HATED that my back was to the door when I was working. There was no way I could part with more books and there was no way that I wasn’t going to be buying more. So, I scrapped the entire idea I had previously for the Office and went back to the drawing board. First, I moved the book case you see in that picture into the closet along with my Ancient dresser for storage. I had built a really horrible shelf in the closet before and it just wasn’t working AT ALL. One thing I did love about my office though was the decision I had made during the renovation to put a phone line and electrical hookups in the closet so my modem and printer could be hidden out of the way – AWESOME. 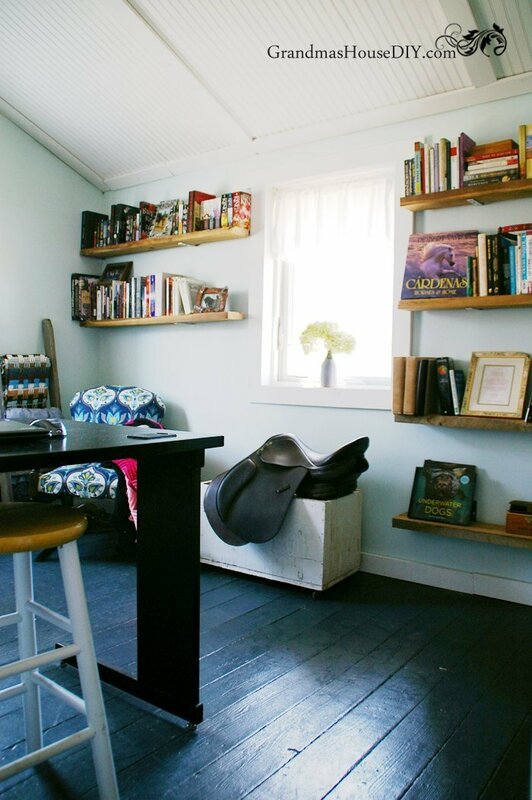 After that I built some serious barn wood book shelves that you guys saw in last week’s blog post: How to build easy barn wood book shelves. So, without further delay, My Office Reveal! The wood floors out here had already been painted brown (over at least two other colors throughout the decades) so I just decided to clean them up and repaint them. We had some leftover paint from painting our second floor Master Bedroom Suite so I just decided to use it on the floors out here. 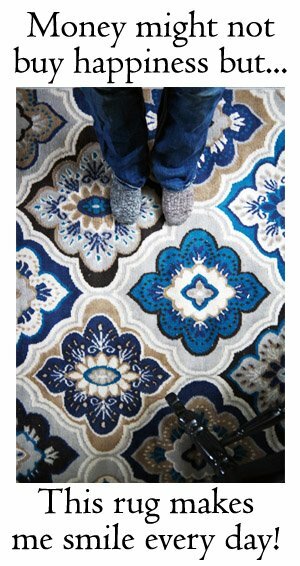 It is a touch blue for my taste (for a floor) but something about these floors really makes me happy and they’ve totally grown on me. The color is called Sooty Lashes by Valspar. Yes, you’ve seen my old rocking chair before – to see what it looked like before check out my post about it: Eleonora’s Rocking Chair: Before and After. I don’t actually own a “desk” those two big tables my mom gave me for Christmas years ago and I love them, they had been a bit dinged up so I repainted them in black rustoleum and put a whole bunch of poly acrylic over them. I wish I had taken before pictures because they really turned out nice! 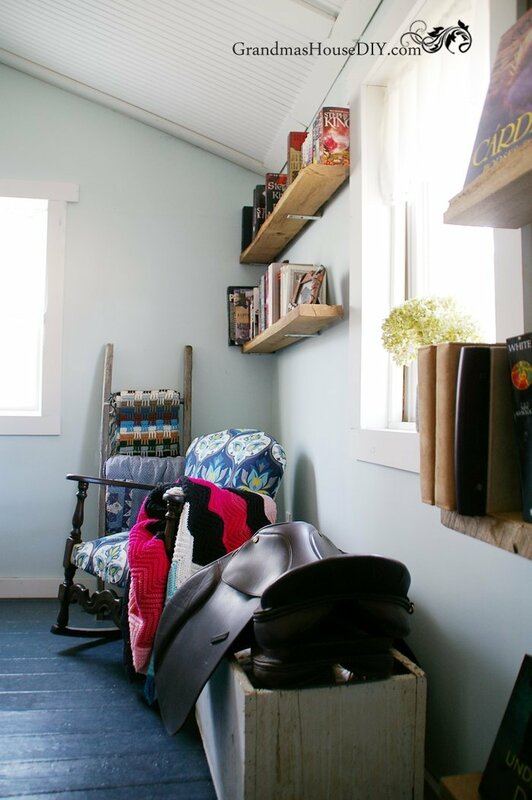 The ladder in the corner by the rocking chair was what I had leftover when I cut the ladder down that I’m using upstairs in our Master closet – to see how I did that you can check it out here: An old ladder into a shoe rack. I think I may hang it up on the wall eventually. My dreams for this office were simple, I wanted lots and lots a book storage and a large enough work space that two people could sit across from each other and work without getting into each other’s way. 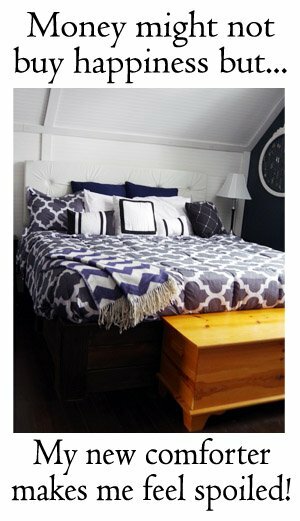 The truth is I just dream in flat empty surfaces, I drool over craft rooms on Pinterest that offer big work tables. I needed a place for my English saddles so I ran out to the barn and grabbed an old box my grandparents’ had made to catch saw dust under their table saw. I cleaned it up and put a coat of poly over it and viola! It also offers some extra storage. Is it kind of weird I have horse tack in my office? Yeah, I guess, but anyone who owns saddles (or leather anything) knows that a damp environment will destroy them and our barn is just not dry enough. So, they have a home in my office. (And there is a perk to having them in here too that no one else has seemed to have noticed but me – they smell like my horses! So, every day I work in the office there’s just the lightest most wonderful smell of horse in here that I just love!) The curtains are from my childhood (I believe I picked them out when I was about 14) I decided to nix the idea of curtains on the windows so I went to walmart and just bought a little white valance to go across the tops of each and then used my big curtains as closet doors. Joe and I had a bit of laugh when I first put this room together and saw my “office reveal part one”. I had agonized over the paint color for a week going through ten different samples until I finally lost my mind and forced myself to pick one. Then I hung my curtains, my artwork and brought my rocking chair in and Joe and I looked around and just busted out laughing. I guess we now know that these are my favorite colors (I had no idea) and clearly I was planning for the last fifteen years for all of these random elements to come together in this room and match. Even my two pieces of artwork that I’ve had since I was at least as young as eleven share a color that is in the fabric I chose for my rocking chair just two years ago. It is truly REALLY funny how things end up. 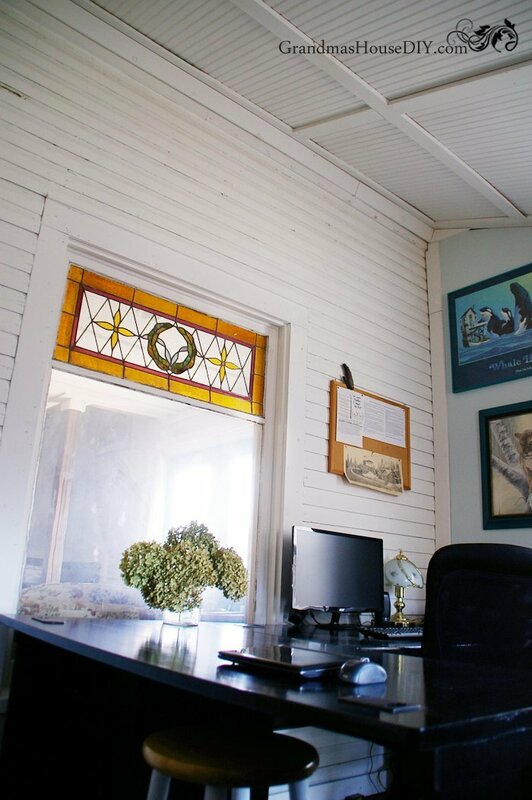 I love my office now and hope you liked my office reveal 🙂 The big old stained glass window is breathing a sigh of relief, as it will not have to weather anymore Minnesota winters or summers, it is safe now, fully inside. I hope it lasts another fifty years with Joe and I – personally I think it is absolutely gorgeous. Joe calls it my “procrastination window” which is more true now then ever because I can literally glance away from my computer screen, through that old window, into our living room and watch tv without so much as having to move my head lol. I have plans on decorating the closet a bit more, you can see I have a couple of art prints that need framing and hanging just sitting on my old dresser hiding the modem, so they will probably go up in there somehow. Yes, we put bead board on the ceilings but that whole wall of wood you see there is actually one hundred year old solid wood house siding that I was NOT going to cover up in any way! So, we painted it and I absolutely love it! Have a great day guys, if you enjoyed My Office Reveal please consider giving it a share! Tarah, wow, I love your office! 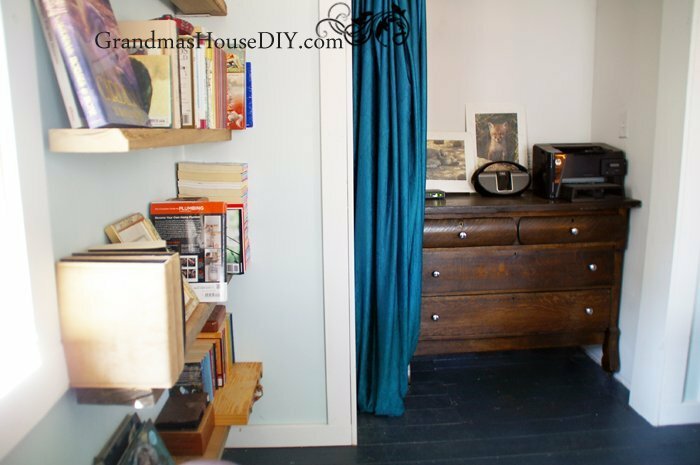 What a striking “before and after.” The rustic wall shelves are a great idea and the blue patterned chair is adorable. The whole room looks so cheerful and efficient. Thanks also for nominating me for the Liebster award. It doesn’t look like I fit the criteria to qualify anymore, but I am very honored and flattered that you thought of me. Congrats on being nominated yourself! It looks lovely….truly lovely. How do you keep it cool in the summer & warm in the winter? Such a nice, clean new look in your office space, Tarah. You are one busy lady–your home is looking just lovely. 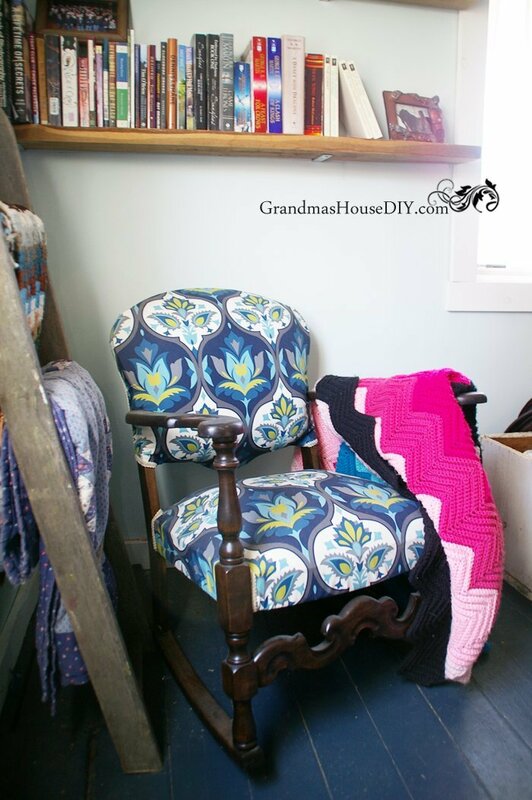 Thanks so much for sharing your DIY and renovation projects with us at Vintage Charm! Thank you Diana 🙂 I was so glad to finally get my office done, sitting in it right now is just awesome, thanks again! Tarahlynn it looks so much better and is really functional now. I know how you feel about having your back to the door. Anyone can just creep up on you. Wow – you’ve been busy! Thanks for sharing on the Pleasures of the NW’s DIY link up! You did an amazing job on your office! 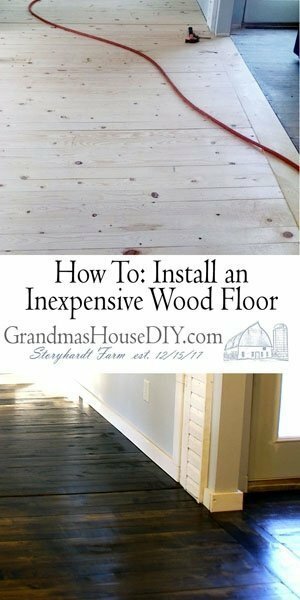 I think the painted wood floors are gorgeous. Thank you for linking up at the #HomeMattersParty this week. Thank you Nicole! I love those floors too! Thank you for sharing this at the Our Simple Homestead blog hop this week. How wonderful is that! 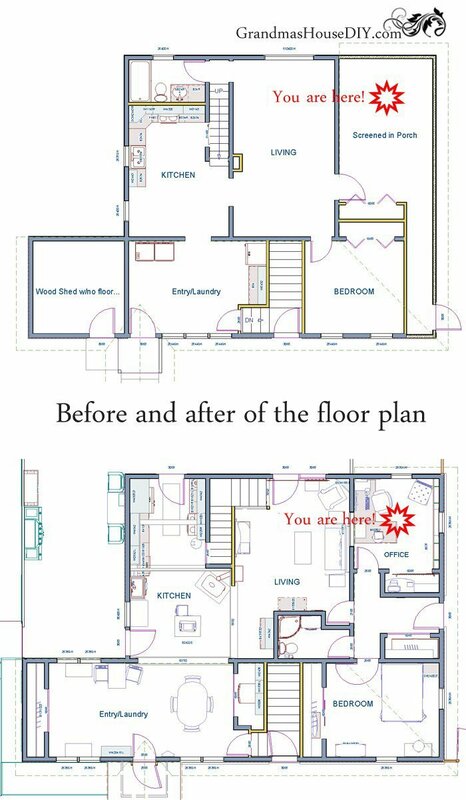 Your making this house so special! I love it! Thank you for sharing at Home Sweet Home! This office has turned out beautifully! This is beautiful and I love the chair. Actually, you have some beautiful vintage pieces that are awesome. Love stopping by and thank you for linking up at Dishing it and Digging it link party. We love having you and hope you have a great week. Don’t forget party this Sunday. Thank you so much Vanessa for always coming by and for putting on a great party! 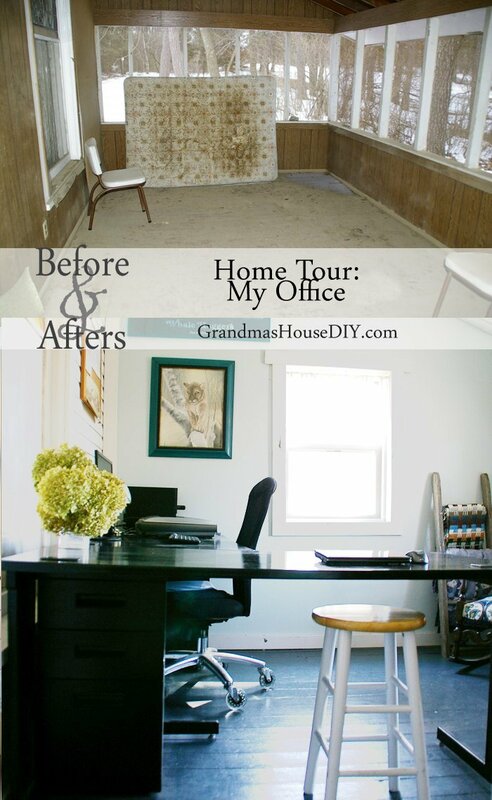 I was so relieved when I finally got my office done, it felt like the house just wasn’t complete for me without it! Tarahlynn, this is amazing and it’s the most night and day transformation I have ever seen. Thank you for sharing with us this week at Celebrate Your Story, have a great week. Thank you so much Sandra, a lot of love went into this room! I love love love that chair! Thank you so much Hollie! You just keep moving ahead and making your house an amazing space, don’t you! Keep it up! I just took over an unused room for an office/craft room and have yet to really “find myself” in my space. Thanks for the inspiration and thank you for sharing at Celebrate Your Story! Hey Chloe, it really took me awhile to find myself in this space too, it was so worth it though! Thank you for coming by!! 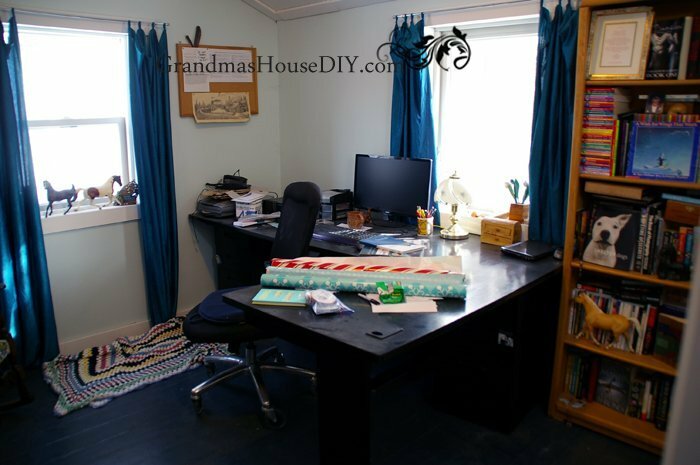 I was excited to read this post because in the weeks coming up I will be redoing my office and in my head anyway, it is all coming together nicely! lol. I love this transportation. You do great work! Thanks for sharing with us at Family Joy Blog Link Up Party this week. I love how bright and clean this room is! I can’t get any work done if my office is dark and cluttered so I love this. Thanks for joining us for the Wednesday Showcase this week. The room looks a lot more open, bright, and airy, now. It looks like a calm and inspiring place to work. 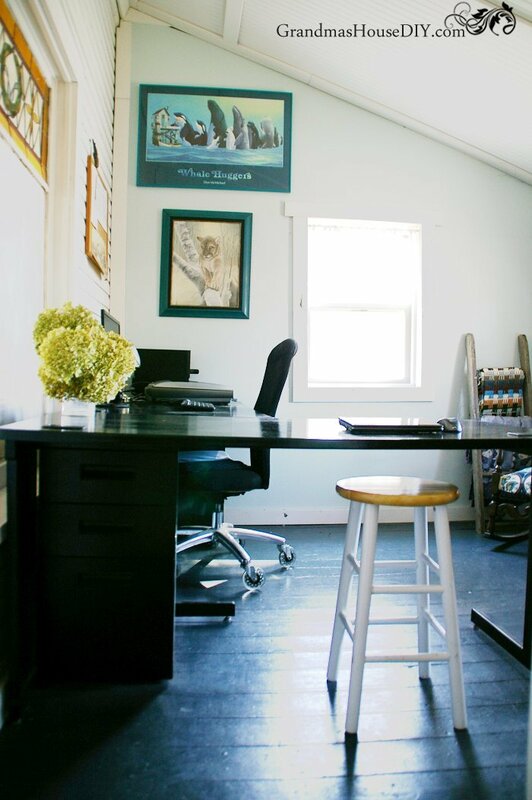 I love how light and bright your office is after you redid it! That patterned chair is gorgeous and the large windows, such a nice place to work. I was surprised about the English Saddle, I don’t remember you mentioning horses before. My hubs currently has two thoroughbreds and they smell so warm. Sometimes it almost reminds me of a warm oregano. They are the most amazing of gods creatures. Thank you for sharing your office, all the pieces certainly fit together, it is funny how cohesive it all turned out. I guess you know your signature style Tarahlynn. Hi Leanna, yup Joe and I have two horses, my gelding I’ve had since I was 11 which means he’s been with me for 20 years 🙂 I don’t ride anymore and I just like having them and loving them. Every morning when I’m getting ready for work I get to watch them and it really is just awesome. Thank you! Thank you! That stained glass is one of my very favorite features! What a great place to work! I love the stained glass window. Thanks for sharing with us at #BloggingGrandmothersLinkParty. I’ve shared on social media. Love the procrastination window. Thanks so much for coming by, have a great week! Thank you Jodie! Have a great rest of the week! Your office turned out absolutely gorgeous! Thanks for sharing your renovations on the Homestead Blog Hop #151! It is a beautiful space! I would so love to work there myself! Oh wow. What an incredible transformation! I’m totally jealous of your office space. 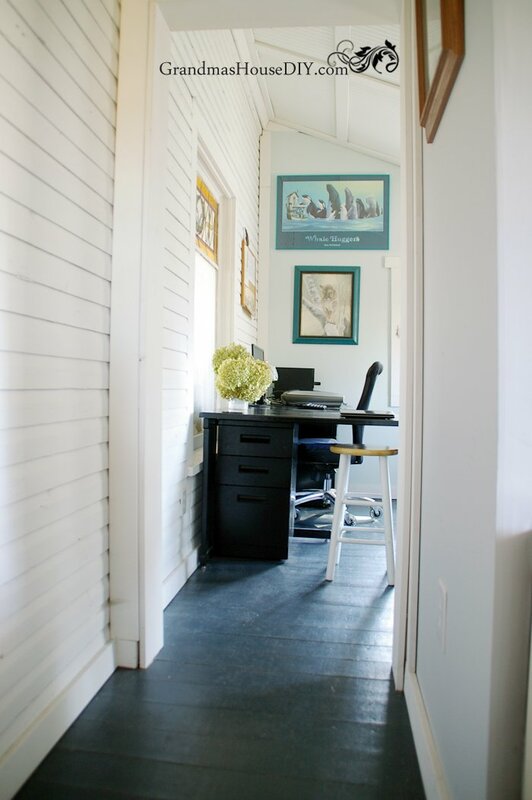 Love all the antique finishes in your office. The dark floors look amazing! Visiting from Whisk It Wednesday. Thanks Carrie, have a great rest of your week! Thank you so much Debbie! Have a great week!